When Sammy's group loses their map on a camping trip, can he use his SEN Superpowers to save the day and lead them safely back to the campsite? 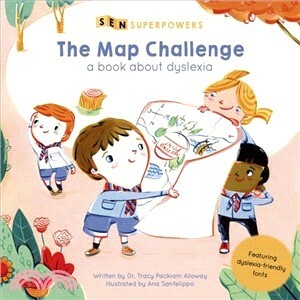 SEN Superpowers: The Map Challenge explores the topic of dyslexia with an empowering story and adorable illustrations. The SEN Superpowers series celebrates the positive traits associated with a range of common SEN (Special Education Needs) conditions, boosting the confidence and strength-awareness of children with those conditions, while also allowing for better understanding and positivity among their peers. Each book includes a page of discussion points about the story, a page of tips for how to boost abilities (inclusive for children with and without special educational needs), and, finally, a further page of notes for parents and teachers. The books feature a dyslexic-friendly font to encourage accessibility and inclusivity for all readers. Tracy Packiam Alloway, PhD is a Psychology professor and Graduate Program Director at the University of North Florida. She specializes in working memory and its role in learning from kindergarten to high school, and the benefits of training working memory. As well as having written several books on the subject, Dr Alloway's work has been featured on Good Morning America, the Today Show, The Washington Post, and many others. She blogs for Psychology Today and the Huffington Post. Ana Sanfelippo studied graphic design at the University of Buenos Aires, specializing in typography. She uses acrylics and inks in her illustrations, and creates artwork for patterns, products, books, and magazines. She also lectures at the University of Buenos Aires.